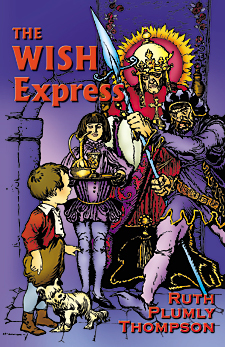 "Marvelous Travels on a Wish, Part 2"
Author of The Lost King of Oz, "The Wizard of Pumperdink", "King, King! Double King! ", etc. Originally published in the Philadelphia Public Ledger, July 23 and 30, 1916. Berens, a little boy who is tired of his home, wishes himself Somewhere Else. He and his little dog, Rags, are bitten by the Dissatisfied Bug, who whirls them through the clouds and aboard a wish, which is somewhat like a trolley car. The wish is full of dissatisfied folks, also bound for Somewhere Else. There is an elephant, a donkey, a farmer's boy, a horse, a little old lady, a little old gentleman, a red-headed little girl, a serving maid and a poet on board. Just as Berens had managed to get a seat a terrible-looking creature came to collect the fares. It was Envy, the conductor of the Wish, and each passenger stole something from the neighbor to pay Envy his fare. Stuffing the articles into his hat, Envy retires, announcing that the next station will be TALKTOWN. As the Wish rushes on its way Berens and Sarah Ann, the little red-headed girl become great friends. Sarah Ann explains that she is going to be a beautiful little girl without freckles when she arrives Somewhere Else. Berens and Sarah Ann exchanged disgusted glances, then both turned their backs upon the old lady and looked out of the window. The wish was rushing through a strange, gray country so misty and dim that the children could distinguish nothing but a confused blur. "Dear, dear!" murmured the little old lady. "What's the matter with them? Have a mint?" she asked at last. Berens and Sarah Ann immediately turned around. The old lady fumbled in her bag and handed each one of them a peppermint. (I don't think they said thank you, but I'm not positive.) Sarah Ann crunched hers in silence, but Berens, who had been curiously looking at the old lady, now rolled his conveniently into his cheek. "You must be very old!" he shouted loudly. "Old?" cried the old lady, bridling angrily. "He means pretty old," shouted Sarah Ann hastily, at the same time giving Berens a little kick. "What?" exploded Sarah Ann, choking on the last of her peppermint. Hastily she climbed upon her knees, and putting her lips close to the old lady"s ear, called anxiously, "Why, surely you don't want to be a little girl again. You'll have to go to bed at 8, you know?" "And get up at 7," shouted Berens in her other ear. "And run all the errands," shrilled Sarah Ann. "And have your neck washed," shrieked Berens. "And dust the parlor," warned Sarah Ann. "And do divisions!" roared Berens, "and - "
"What's all the rumpus?" wheezed the elephant, opening one eye. "She wants to be young again," explained Berens. "Nonsense!" cried the elephant, waving his trunk. "I'd rather be an old party any day!" Feeling, no doubt, that this settled the matter, he went off to sleep again. "I don't want to be a little girl," chirped the old lady as soon as she could make herself heard. "I want to be a young girl just about 18," she finished with a nod of her white head. Berens and Sarah Ann had ceased to pay attention by this time, though. "Just think!" Sarah Ann was saying in a low tone, "she can stay up as long as she pleases and have two helps of pie and - "
"Listen!" cried Berens suddenly. There was no need to listen. The air was full of a hideous noise like the roar of a hundred sawmills. "My ears!" shrieked the donkey, hastily covering them with his hoofs. Every one covered his ears except the elephant. His were too large to cover. "TALKTOWN! TALKTOWN!" bawled N. V., thrusting his hog's head through the door. "All get out," he commanded, waving his fins impatiently. At this all of the passengers jumped to their feet or their hoofs as the case might be and hurried from the wish. Rags had awakened at the terrible confusion and he and Berens had run out after the rest of the party. The noise grew steadily worse. The wish had stopped on the corner of what appeared to be an everyday sort of a city. With his fingers in his ears Berens looked curiously round. It was dusty and dirty, the houses were tumbling and crumbling to bits, the streets were full of rubbish and the gardens overgrown with weeds. More people than he had ever before seen in his life were standing about on the corners - all of them shouting at the top of their voices. "Great cat tails!" exclaimed Rags, his ears laid flat against his head; "what in dog biscuits is the matter with 'em?" While Berens had been looking around, Sarah Ann and all the rest of the wishers had disappeared. "We're lost!" cried Berens in dismay and started on a run down one of the crooked little streets, Rags at his heels. The noise was so confusing that it fairly made one's head spin, and the first thing you know Berens had stumbled over a little girl and rolled her into the gutter. He took his fingers from his ears and quickly picked her up. The child, paying no attention to the accident, went on playing with a little black pig - (the streets were full of children and pigs). A window just above opened at this and a frowsy woman stuck out her head. "I'm a-going to make Mary a blue dress with green buttons!" she called shrilly. "I'm a-going to make Sally a yellow dress with a pink sash!" screamed another woman. Now windows all along the row were thrown up. "I'm a-going to - pink! green! red buttons - going to - red sash - " All of the women were shouting at once, and Berens could make nothing of it. Berens noticed now that none of the children had dresses. They played on unconcernedly, not appearing to notice the racket their mothers were making overhead. "White blouse - pink - going to - " and dear knows what not besides came clattering down to Berens' ears. "Whew!" he whistled, covering his ears. "Why don't you do it then?" And he and Rags took to their heels. At the corner of the street a great crowd had gathered round a man who stood waving his arms from a barrel-top and shouting even louder than the women that Berens had just left. Just as the two reached the corner and Berens uncovered his ears to hear what the old fellow might have to shout, the barrel collapsed and swallowed up the orator. To Berens' amazement, he did not even pause to get his breath. "I'm a-going to write a - " came in a loud voice from the broken barrel staves. Waiting to hear no more, Berens hurried on, hoping to catch up with Sarah Ann or even with the cross old lady. He had run only a few steps when a think little man bounced out of a tumbledown house and seized him by the coat button. "See this house?" shouted the little creature in his ear, "well, I'm going to get a load of bricks and I'm a going to bring the load of bricks up to this door (with a wave of his hand) and then I'm going to build new foundations and after that I'm a going - "
"Look out! Look out!" barked Rags in alarm. But he was too late. The house collapsed, falling forward with a crash and burying the three of them under a mass of rotten timbers and crumbling bricks. Fortunately, it was so very old that none of them was hurt, and Berens after some difficulty managed to crawl out. "Rags! Rags!" he called anxiously. "Where are you?" "Here!" came a muffled voice from under a huge pile of the stuff. Sticks and bricks and bits of plaster were spurting into the air as Rags vigorously dug with his front paws and kicked with his hind legs. "House about one's ears! Nonsense! Outrage!" Berens could hear him sputter. At last Rags had excavated himself and with an indignant shake growled crossly, "Is this what you call bringing down the house?" "I'm sure I don't know!" said Berens. Just then there was a stir from beneath the roof of the house which had fallen into the middle of the street. Out through the chimney popped the head of the little man. " - and after I get that done I'm a going to - "
"Help!" cried Berens, and ran off as fast as his legs would carry him. The streets of Talktown seemed to go round and round and round. "Why, we'll never get anywhere!" cried Berens at last. It was impossible to stop, however, for the streets were full of the rudest people, who pushed and jostled them along whether they wanted to go or not. "I'm a going to make a statue, and there ain't never going to be another statue like this here statue I'm a-going to make!" bawled a great lump of a man, seizing Berens by the coat tails. "Let go!" snapped Berens, jerking himself away. But everywhere wild-looking individuals stopped him and shouted in his ear, "I'm a going to do this" and "I'm a going to do that." "Well, I wish they would do it, then!" thought Berens wearily. "What's the use of all this noise?" At last the two, hot and tired, were hustled into a large square. There did not seem to be as much shouting here, or perhaps they had grown more accustomed to it. From a platform in the centre a large man in an evening coat was booming in a thundering voice, "PEACE! PEACE! PEACE!" "Why, there's the donkey!" said Berens suddenly, and sure enough, on the edge of the crowd, stood the donkey waving his tail and cheering loudly. "PEACE! PEACE! PEACE!" shouted the large man incessantly. "And there's the elephant," continued Beren in an interested tone. Here the elephant pushed the donkey rudely aside. "Nonsense!" he bawled through his trunk. "Nonsense!" "PEACE! PEACE! PEACE!" thundered the speaker, paying no attention to the elephant. "PEACE! PEACE! PEACE!" insisted the big man, with the water trickling down his nose. "I'm a going to do this and I'm a going to do that," shouted the people in the crowd. "Oh, dear!" signed Berens. "This is the stupidest meeting I - "
"Run, run for your life!" called a hoarse voice in his hear, and Berens, turning round, caught a glimpse of his friend the horse galloping by like a whirlwind. Seizing Rags he dashed after it. The racket behind them was frightful. Crash after crash came splintering through the air. People were running and tumbling, but above all the confusion he could still hear the voice of the big man calling, "PEACE! PEACE! PEACE!" When he had run about so far - and how far so far is you will have to guess - he looked anxiously over his shoulder. "Whew!" whistled Berens, and ran faster than ever. No wonder! An army of ferocious-looking men had ridden into the square and were charging into the midst of the talkers, driving them in every direction. The houses were crumpling up like so many match boxes - and between you and me it is no wonder, for all the houses in Talktown are built of words. "I'm a going to - going to, I'm a - " shouted the inhabitants of this remarkable city, even as they fled. Now the elephant went thundering past Berens in a cloud of dust. "Just what I expected! Just what I expected!" he was grumbling to himself. Behind him panted the little old lady with her umbrella up. "Oh, my rheumatism! Oh, my dyspepsia!" Berens himself ran faster and faster; as for Rags, he ran along like a rabbit chased by a fox. Just as Berens felt that he could not run another step he spied the wish. With a sigh of relief, he climbed aboard. Soon all the other passengers came panting along and sank heavily into their seats, fanning themselves with their hats or their ears or their tails or with whatever else happened to be handy. "Glad to see you back! Hope you had a pleasant time!" it murmured politely. "Pleasant time!" rumbled the elephant wrathfully. "Pleasant time!" exploded the little old man. "Pleasant time!" screamed all of the passengers together, while the horse nearly choked with indignation. "Well, don't blame me!" exclaimed the Dissatisfied Bug, waving its arms apologetically. "You all want to go Somewhere Else, and you've got to go through Talktown to get there, and the only way to get through is to stop, you know!" "Lies just on the other side of the State!" said the Bug, and pulling on its 19 serviceable cotton gloves, it hurried out on the platform. In less time than it takes to tell the wish was under way again. Sarah Ann and Berens found themselves seated on either side of the horse. "I had a perfectly awful time!" confided Sarah Ann to Berens. "I'm a goin' to! I'm a goin' to!" sniffed Rags, settling himself with a flounce in Berens' lap. "But never mind!" continued Sarah Ann, "we'll soon be Somewhere Else and then - and THEN!" she clapped her hands gleefully. "Then," shouted the serving maid, bouncing out of her seat, "then I'll be a real lady! No more 'Yes, sirs,' and 'Yes, ma'ams' for me! No more getting up at 5 - Oh! Oh! won't it be fine?" "Isn't she silly?" whispered Sarah Ann to Berens as the serving maid flopped giggling into her place again. "Then I'll be a millionaire!" shouted the farmer's boy, waving his rake hilariously - "a real swell 'un, too!" with a wink at Sarah Ann. "Silence!" thundered the little man in the top hat. Now he leaned impressively across the wish and tapped Berens on the knee with his cane. "I don't mind telling you that I'm going to be KING when I get Somewhere Else," he announced grandly. "King!" gasped Berens and Sarah Ann in amazement. Some of the flags colored by you boys and girls were real works of art and Mr. G. Ography was so delighted he decided to have another flag puzzle. Here are the flags of five neutral nations. Put in the names, color them correctly and mail to Mr. G. Ography. There will be ten prizes for the ten best-looking and correct answers. As the times are so rapid nowadays, I just want to say that these five countries are neutral on the date this puzzle was written, June 18. "Liberty and union, now and forever, one and inseparable!" --Daniel Webster. "I have not yet begun to fight!" --John Paul Jones. "Millions for defense, but not one cent for tribute!" --Charles C. Pinkney. "I only regret that I have but one life to give for my country!" --Nathan Hale. "Don't give up the ship!" --Captain Lawrence.